Earn up to 2 Reward Points for this item. Working through various sample packs at the moment, and these are among the best (possibly THE best). The blade cuts through my beard with no pressure, no resistance, and no subsequent irritation. Plus they’re cheap, so I can’t ask for anything more! i ordered these blades for my son in law he said they are excellent,best blades he’s used,very happy. Very good blades. Have tried a range and settled on these. Good price when bought in bulk. Quick service. I like Astra, sharp but forgiving. I like the Astra, sharp but forgiving. Good blades lasting me around 5 to 6 shaves so rather pleased. 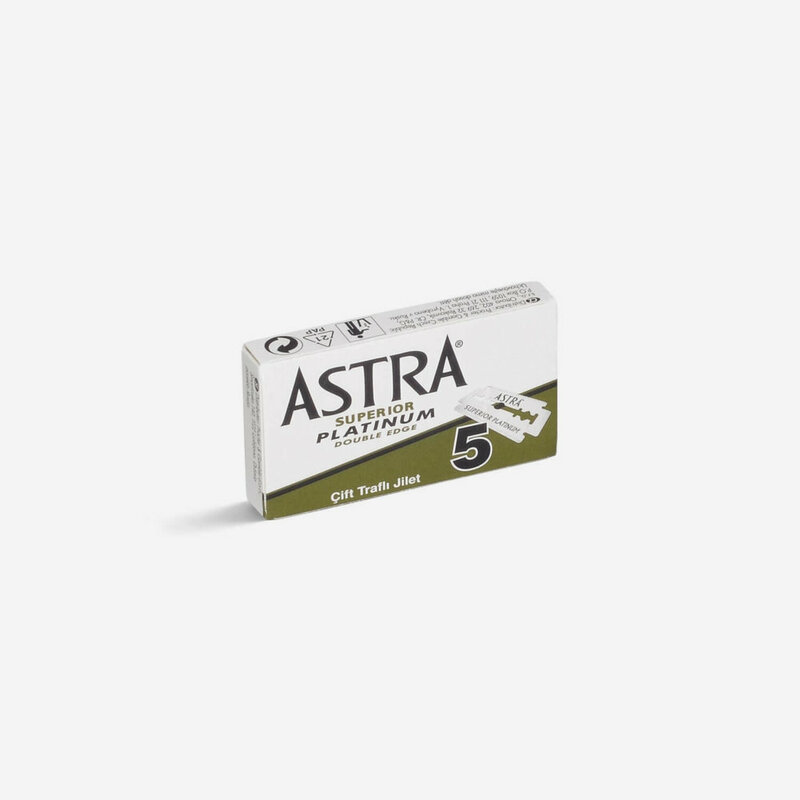 I love Astra, they are smooth in use and last me a week per blade, and at 50 blades for £10 that’s nearly a years shaving. I really like these. I’m still new to DE blades, but having tried a few others these are my favourite so far. Pretty sharp and very smooth. Made a massive difference in terms of comfort, will probably stick with them for a while. These are smoother than Astra’s Superior Stainless, I find. I am still experimenting and will try Feather blades next. Having used one blade for a couple of shaves, I’d say this was a reasonable middle-of-the-road blade. It didn’t nick or scratch, but neither did it give me a particularly close shave. Some of that may have been down to the software I used though. These Astra Green blades are ideal for the “infamous” Muhle R41. They give a nice smooth responsive shave. A good pre- shave medium is a must with this blade/razor combination. Nice that each blade is double wrapped too. The Astra platinum has been the best blade for my Muhle 41 razor so far. The blade kept its edge for seven days and was very forgiving, few nicks and no razor burn. Positively silky smooth compared to using Derby blades. First impressions were not great. The blade seemed flimsy compared to the Derby, there was a superfluous second paper wrapper on the blade and it had been gummed down. However, I chose to judge the blade on its shaving qualities rather than its packaging and I was very pleased with it. This week I have switched to a Wilkinson sword blade, and while that is also preferable to the Derby it feels more aggressive and I have to be a little more cautious around my nose and chin. Last comment; get a sample pack to find which blade works best for you. I think that these blades are pretty good. With a new blade it is easy to get a close shave. However, the blades didn’t stay sharp enough to get more than two or three daily shaves before becoming blunt and causing a painful razor burn which lasted for a few days. If you are happy to use a brand new blade each day then the Astras will be a good option. Would I buy Astra blades again? Yes. Would they be my first choice? Probably not. For my money, the Wilkinson Sword blades are great value and Shark blades provide the closest irritation free results.